To read about past trips, please select a date on the left. Visit this site to learn about the adventures of a bunch of rednecks devoted to canoeing the rivers, swamps, and sloughs of the area. 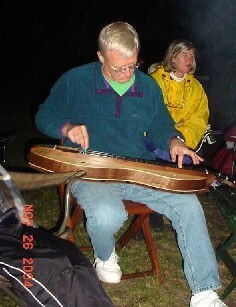 You will meet those who view trips as a fun undertaking rather than a demonstration of paddling skills. You will not find a political agenda. The group includes some tree huggers and others who hold Rachel Carson responsible for many thousands of African malaria deaths. There is wide range of humanity represented. Those who would save the world are welcomed but that is not the point of the group. Fargo, GA--Two dozen Fellow Travelers gathered at Griffis Fish Camp for the annual after Thanksgiving event. 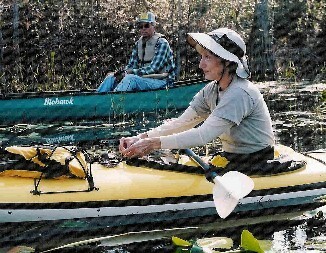 Several, however, did not join the first day of paddling but did e lect to eat supper and canoe the second day in the swamp. Kim and Dave Lippy and John Williams actually spent Thanksgiving night at the camp. Joel and Chance Everett spent the same night in the famous Fargo Gator Motel. Art and Janice Shelfer, Jerry and Donna Ellis, Roy, Eric, Justin, and Nathan Moye, Hamp Chauncey, Garrett Register, and Charlie and Diane Stines met on time for the launch. Cars were shuttled to the take-out at Reeves Landing, and all returned to the camp for the put-in. A miscommunication with Greg Baker delayed the start, but a phone call revealed that he had chickened out. The canoes and kayaks were on the river by ten. Blakeland Spiers was the only rookie, and at seven she was the youngest paddler. She also came the greatest distance, having flown in from California. Chance Everett (the Crown Prince), Justin Moye, and Nathan Moye made up the young bunch. All were delightful to have along. 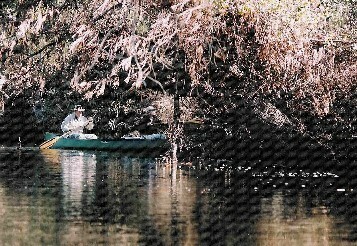 The upper stretch of the Suwannee was high, but not dangerously so. The current was swift, and there were no sandbars. Temperatures for the morning were in the high forties, but by the time of launch the fall day was pleasantly warm. 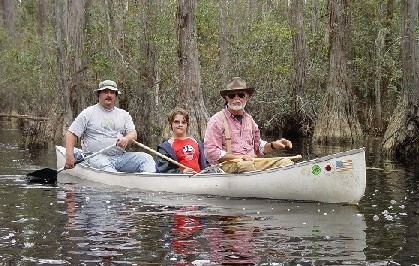 Once paddling was underway, the group stayed together well. Donna and Jerry were in kayaks, and John, Kim, and Dave all soloed. 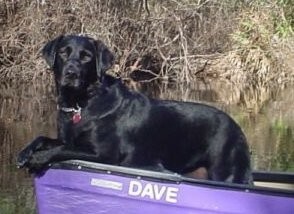 Well, Dave did not exactly solo since Trekker, his black lab bow bunny, rode a long. Everyone else had a partner. The canoeing was pretty much as expected. There were no unfortunate episodes. It took some fancy paddling to keep the boats out of the brush on the swift winding river, and there were some places where paddlers had to negotiate through brush, but no one had to leave the boat for pull-overs. Wildlife on the Suwannee was limited to squirrels, turtles, and lots of birds, especially ducks. The river itself was a bit muddy but retained some tannic blackness. The late autumn sky was perfect, and there was no threat of thundershowers. Because of the high water, there was scant trace of goofing-off stops. The dinner stop was in a bank amidst briars and brush, but it was a refreshing stop. John and the Shelfers stayed in the boats to eat their goodies. After lunch the paddle toward Reeves Landing resumed. It was much the same. The river became no bigger, slower, or straighter. The Fello w Travelers maintained a leisurely pace but arrived at Reeves Landing shortly after two. It was time to load the boats and head for camp. 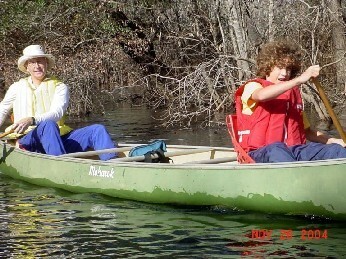 Donald May and Haley Chauncey met the paddlers at the take-out so that everyone would have a ride to camp. Once back at camp, those who had not already pitched tents did so. Griffis Camp is somewhat primitive, but it was a pleasant experience. Everyone got a chance to see the Pepto Bismol paint on the canoe trailer, and Diane had Fellow Traveler decals prepared. They were distributed as gifts. Just where they will be displayed is left to the imagination. Roy prepared spaghetti noodles, Kim prepared her special spaghetti sauce, and Charlie provided bread and salad. Supper was ready before the early darkness came, and no one q uestioned its quality. The three-burner Coleman stove provided a little excitement as it decided at one point to produce a huge flame. The King pulled off the fuel tank, and the flame subsided sometime afterward. Donald and Gloria May, Mike and Blakeland Spiers, and Haley Chauncey had arrived for supper. Hamp, Garrett, and Mike built a very nice campfire, and the group gathered around for conversation, lies, and the real treat, which was dulcimer music provided by Dave Lippy. Thankfully, no one added vocals. Camp was disassembled after breakfast, and boats were loaded onto the trailers and vehicles for the seven-mile drive to Stephen Foster State Park. Upon arrival, they were launched and everyone paddled the day-use trails. John Williams and the Shelfers elected to rent a motor boat to see the swamp, as John had never actually been to this site. Most went to the Minnie's Lake shelter. There were several alligators taking in the warm sunshine. Charlie managed to go all the way through the Middle Fork Run without hitting a single tree. The shelter had other paddlers there, and it was quite the traffic jam. Donna amused everyone with her graceful exit and entry of her kayak. After eating the goodies and talking with the other paddlers there, the group headed back to Stephen Foster. By that time, the predicted afternoon showers appeared to be near, but the paddlers were able to make it back to the park and load the canoes before the rainfall actually began. All said their good-byes and expressed hopes of making the next trip. It was an excellent outing.